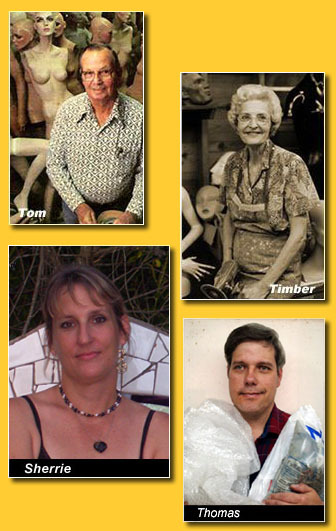 Modern Mannequin is a family owned and operated mannequin repair and refinishing business started by Tom Childress in 1946, and passed down to daughter Sherrie Childress after Tom passed. Sherrie's brother, Thomas, contributes by constructing bags of packing materials, thus insuring a safe arrival when our mannequins are shipped. With a history of 71 years in business, Modern Mannequin takes pride in its efficiency and customer service. Our customers range from movie special effects artists, major department stores, musicans, small shops, museums, schools, individuals and even "spook houses". We have seen many creative ways that mannequins have been used- decorations at parties, anniversaries to display mothers wedding dress, plays, theaters and photographers use them as props. Even our shop and warehouses have been used as backdrops for movies, magazines and videos. 2007, Austin, TX band - Dremnt the End, Produced by PaperTank Productions. 1985, Classic martial-arts actioner film by Grodon Hessler, "Pray for Death." We value each and every customer, and as Tom always said "We might not have made much money, but we sure made a lot of friends". If you would like to know more, here is an article written about us.